I'm really glad today that we have freedom of choice to do what we like, and, in fact, even though I decided to make a fresh cream sauce this year, I also wanted my homemade version to come pretty close to tasting like the classic cream soup version so many of us are endeared to, so there's isn't a bunch of frou-frou in my recipe either - like a boatload of thickly sliced mushrooms, highly caramelized onions, and 999 various herbs and seasonings that make it taste like something totally different. Also, while I don't mind fresh or frozen green beans, and I've made several green bean casseroles with them, cut, whole and even french style, I always come back to the canned, cut green beans. It's the texture I like and expect, though you certainly should use your own favorite. Don't think for a second that I'm skipping the fried onions either, because, well... I like my green bean casserole with them and frankly I don't find homemade onion strings to be anywhere close to the same. The sauce here is just a basic butter based roux, similar to the Broccoli and Cauliflower Casserole I just posted, so truly it's not any trouble to make. I based it on my version of homemade condensed cream of mushroom soup essentially, which I think has a proper balance of veggies. The only different is that I used fresh mushrooms this time because I had them in the fridge. Don't slice them - finely chop them. Couple of notes. Most of you know that I prefer to use unsalted butter in my cooking, with few exceptions. There is so much sodium present in so many other things we all use to cook with these days. Unfortunately folks don't tend to think of that until they taste a finished product and realize it's far too salty because they didn't factor that in. I often lean toward lower sodium products where I can use them because of this, so that I can control any added salt. You've probably also noticed I prefer kosher salt primary over table salt for cooking. I actually had a fella who took the time to email me that I wasn't a true southerner because I didn't use the umbrella girl salt. Well, while I give y'all measurements, I prefer to use pinches in my cooking, and with kosher salt you can feel how much salt is in your fingers. For times I only need a cup or two of broth, I also usually make it from Better than Bouillon, and often add no to very little salt, such as the case here. Remember, always be mindful of all sources of salt in the products you use, taste first, before adding any salt, and then only add a little, taste and adjust. If you don't have so large of a crowd, this casserole halves beautifully and my photographs here are actually of a halved recipe, though I swear I could eat a whole 9 x 13 pan of it all on my own. If using fresh green beans, cut, then blanch first in a pot of boiling water for 3 minutes; drain and plunge into a large bowl of ice water until cooled. Drain again and set aside. Skip this step for frozen or canned beans. Butter a 4 quart (9 x 13 inch) baking dish; set aside. Preheat oven to 350 degrees F.
Cook bacon in a large deep skillet until crisp; remove to a paper towel to drain. Once cooled, chop. To the bacon drippings add the onion and celery, cooking until tender, about 3 minutes; add mushrooms and cook another minute. Add the butter and stir in the flour, cooking for 2 minutes. Stir in chicken broth, a little at a time until well blended. Add the half and half, soy sauce and black pepper, until blended. Add green beans, half of the chopped bacon and 1/2 cup of the fried onions; gently folding until beans are coated. Taste, adding salt only if needed. Transfer to casserole dish. Bake at 350 degrees F for about 25 to 30 minutes or until bubbly. Sprinkle top of casserole with remaining fried onions, using more or less as desired, and return to the oven for about 5 minutes longer, or until onions are lightly browned. Remove and garnish with remaining bacon. Cook's Notes: You may use any style or type of green bean for this recipe, frozen or canned, so use whatever your favorite is. Blanching is not necessary for frozen; simply allow to thaw. Canned mushrooms may also be substituted for fresh. Green Beans Supreme: Substitute one (8 ounce) container of full fat sour cream for 1 cup of the chicken broth, adding additional half and half or milk as needed to loosen sauce. Top casserole with 1/2 cup shredded cheese and mix 1/4 cup of soft bread crumbs with 1 tablespoon melted butter and sprinkle on top of cheese. Add remaining fried onions on top, or omit. Thank you, Mary! 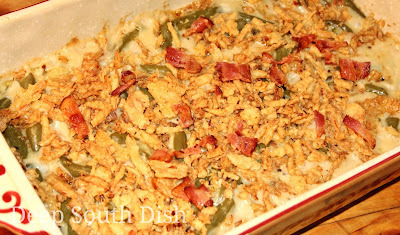 I didn't plan on serving green bean casserole this year but thanks to your recipe I'm adding it back to the menu. Happy Thanksgiving to you and your family. 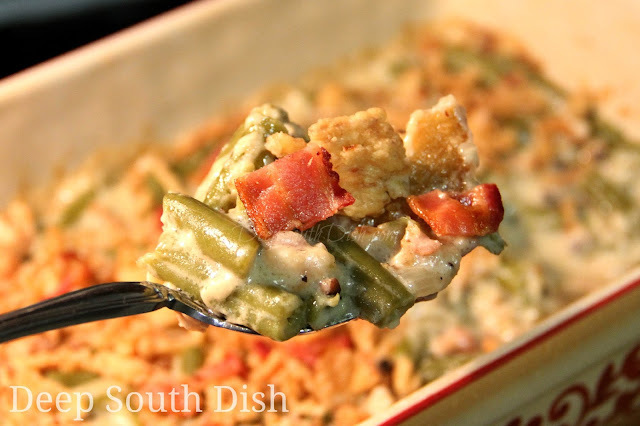 The holidays are just not the same for me without a green bean casserole! Happy Thanksgiving Angela!! can this dish be made the day before Thanksgiving?